Forty Days of Yoga - Breaking down the barriers to a home yoga practice takes yoga practitioners on a journey into their psyche and examines what really stops them from practicing yoga. With the use of worksheets, it helps them design strategies to make daily practice possible in their life – no matter what their life is like. With the help of this book yoga practitioners realise that they already have the time, space, will-power, discipline and know-how to create and maintain their home yoga practice. All they’ve been missing is the single-pointed focus and clear strategy to make it happen. This is not a one-size fits all solution – this is a journey into the mind that helps practitioners tease out their personal reasons for blocking or sabotaging their home yoga practice. 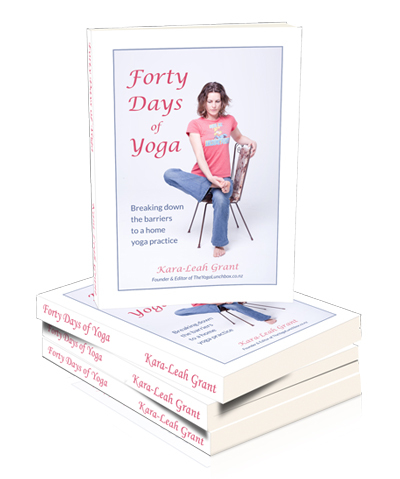 Forty Days of Yoga isn’t just a book – it’s a workbook. That means you can’t just read it. You have dive deep and do it.